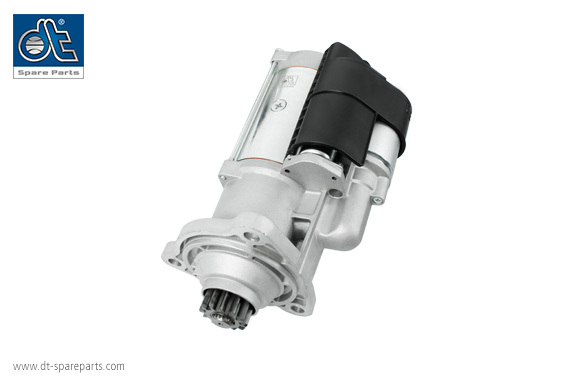 Starter motors are used in trucks and buses to start the engine of the vehicle. In order to ensure the reliability of commercial vehicles, the engine must be safely started under all operating and environmental conditions. For this purpose, the starter motor must bring the engine up to a sufficient rotational speed within a few tenths of a second. To start an internal combustion engine, two parallel-acting magnets of different strengths in the magnetic switch are activated via an auxiliary relay when the ignition key is turned. The magnets shift the pinion gear of the starter motor, thereby tensioning a spring in the magnetic switch. The pinion gear meshes into the flywheel of the engine and the magnetic switch closes the contact to the starter motor and starts it. The anchor of the starter motor accelerates the flywheel over a planetary gear and the pinion gear, and thus the crankshaft of the internal combustion engine, until this is running automatically and the ignition key is released. Starter motors of the DT® Spare Parts brand fulfil the high quality and safety standards of the automotive industry. The starter motors withstand extreme climatic conditions and cover an ambient temperature range from -30°C to +60°C. To ensure a long service life and optional functioning, all components of the starter motor are manufactured from high-quality materials. Markings on the housing enable clear identification and traceability. Starter motor pinion gears of the DT® Spare Parts brand are made of hardened special steel with high surface quality. The chamfered tooth flanks of the pinion gear ensure perfect meshing in the flywheel. Damage to the pinion gear and the flywheel are thus avoided and the power of the starter motor can be optimally transmitted. The ball bearing housings are manufactured in an aluminium diecasting process. They contain high-quality ball bearings, sealed on both sides, to enable perfect functioning of the starter motor. By the use of highquality shaft seal rings, the internal parts are well protected against moisture penetration. The rear housing also contains a ground/earth connection and a condensation drain hose for ventilation. Only highly-resilient pinion gears are used for planetary gears of the DT® Spare Parts brand, thus ensuring long-term functioning of the starter motor. The magnetic switches have connection threads made of copper, which provide very low contact resistance. Due to the low resistance, a loss-free power transmission is made possible and heating up of the contact points avoided. The starter motor carbon in the carbon-brush holders are manufactured from special carbon and enable a long service life, even with frequent start-up operations. In the carbon-brush holder there is also an over-temperature sensor, which switches off the starter motor during continuous starting, and thus protects against overheating. In addition to starter motors, the complete range of the DT® Spare Parts brand offers all other spare parts for engines.